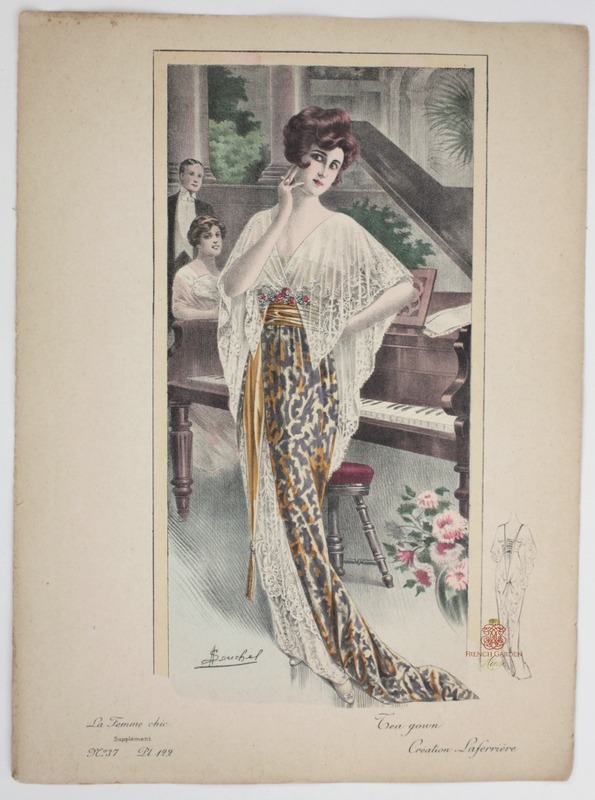 Exquisite color plate from the French Couturier Fashion magazine LA FEMME CHIC, printed in Paris, France in the very early 1900's. 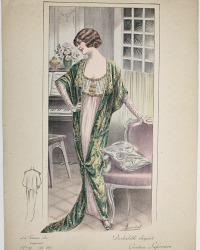 Marketed toward the Paris elite, La Femme Chic, along with several others, was an influential magazine defining new trends in fashion during the the early part of the century. It was published between 1916 - 1939. Tea Gown Creation Laferriere is a beauty, La Maison Laferriere, couturier, of Paris, was on Queen Alexandra's list of preferred royal couturiers since 1903. Divine in a print of dove grey and yellow silk or perhaps panne velvet, the gown is resplendent with hand made French lace, both for the underskirt and the trailing collar which covers the arms like a stole. Divine! Petite glamourous peau de soie shoes, a few diamonds, and madame is the star of the afternoon, despite the fact that she doesn't play the piano! Elegance, style and on the brink of the Roaring Twenties, this gorgeous and very collectable fashion plate was colored completely by hand in stunning colors of grey, yellow, pink, wine, red, brown, green, blue, and dove grey. Executed by some of the most prominent French artists, each is an original work of art, this is signed Souchel. To be expected in prints of this age, there may be a few characteristic areas of foxing etc., this print is in beautiful antique condition. Perfect to frame, loves the company of others. Display in a grouping, these feminine prints make a stunning statement! Print measures: 14-1/4" x 10-3/4".